We recently told you about PopSafari, a site similar to Pinterest in that it allows you to post photos in themed collections, but with the distinct difference of allowing groups of users to contribute to one collection. Since our review, a few new features have been added, and the founders are working on the ability to moderate collections. Until then, Ourspot, a brand new site which has just launched will give you that feature right now, by allowing you to choose who can contribute to your collections. 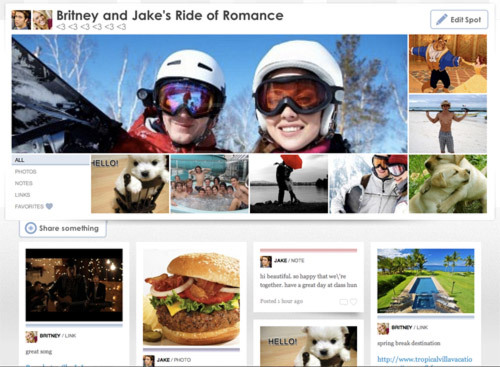 Ourspot is an interesting combination of a photo sharing site, a social bookmarking site and a social network, with the added twist of group contributions, all coming together in a virtual pinboard format. When you sign up for a free account, you can create your first collection or ‘Spot,’ select a name, description and add other Ourspot users to it, allowing them to contribute images, links and more. With Facebook integration, you can easily add friends already on your Facebook friends’ list directly from the site. With each Spot, you can choose a cover, much like Facebook’s new cover feature available in the new Facebook Timeline, and can even import your current Facebook cover, at the click of a button. You can instantly start to add items to your Spot from the status update box at the top of the page. Like on Facebook, adding a link to the box automatically attaches it to your post. You can also add text-only posts, upload photos, and also automatically share your Ourspot posts on Facebook. You can also make your Spots public or private. As you add links and updates to the Spot, you can also add specific posts to your favourites, which are then displayed as a featured grid around the Spot cover. Posts in each Spot can be filtered down to display just links, photos, notes, or favourites. You can also add other users’ updates to your favourites, which are then displayed on a separate page, along with your own images which you have favourited. While being able to add your own images to your favourites is a great way to highlight images you want your friends to see first, it’s also a little bit confusing to have them shared alongside your favourite images shared by other users. Other users can view both your profile page with all of your Spots, a link to your favourites, and the Spots that you follow. All of the public posts can be seen on Ourspot’s Inspiration Wall. Ourspot can be used in exactly the same way Pinterest is used – a social site for sharing your favourite images and links, with the added ability to share status updates, but where Ourspot really comes to life is when it is used as a group tool. So far one of the most popular uses for Ourspot seems to be by couples, with several Spots dedicated to chronicling personal relationships and memories. Thanks to the privacy feature that Ourspot affords users, groups can share photos from one event, making it an easy way to collect all the photos taken during a special occasion or on a group trip, visible only to users who can contribute to that Spot. There’s no limit to how this feature can be used, from students collecting information for a group project to friends simply sharing content together in a make-shift private social network. Ourspot’s founders do place an emphasis on the act of preserving memories using their service, but it’s flexible enough to be used in whichever way you want. Ourspot is a little clunky to use at first. Navigating the site can feel a little unwieldy, and making your way from public posts, to user Spots to user profiles is somewhat confusing. Once you get the hang of what each feature is supposed to do, the site becomes extremely useful, and is yet another great tool for creating a beautiful visual account of your life, memories, or anything you want it to be. It can be used as a look book or a writer’s story board. It can be used as a designer’s inspiration board, or simply gives friends a platform to communicate privately or publicly with one another. Have you tried out Ourspot? Let us know what you think of it in the comments.